Errol: Yes. I went there. I’m pretty sure half of you have shipped them together already. I always thought of Rob and Jen as a brother-sister-relationship. Whereas Rob and Bea would be a very interesting match! 🙂 Let’s give them a chance! Yes! In the end, it became more brother/sister relationship! …on a calmer note, I should’ve seen it coming. Ah. Alright. Let me go down with Rob/Jen ship. Rob/Jen, of course. OTP since the beginning. *laugh* well, I don’t think of the characters as shiny toys! Huzzah! I surprised a few people! Yay! Yep, I was waiting for it. *laugh* That was… two years ago! Impressive! 😀 And yes, I think Rob is a romantic at heart! When Bea commented on bribing Rob with chips for word wars, I figured there was something going on between them. 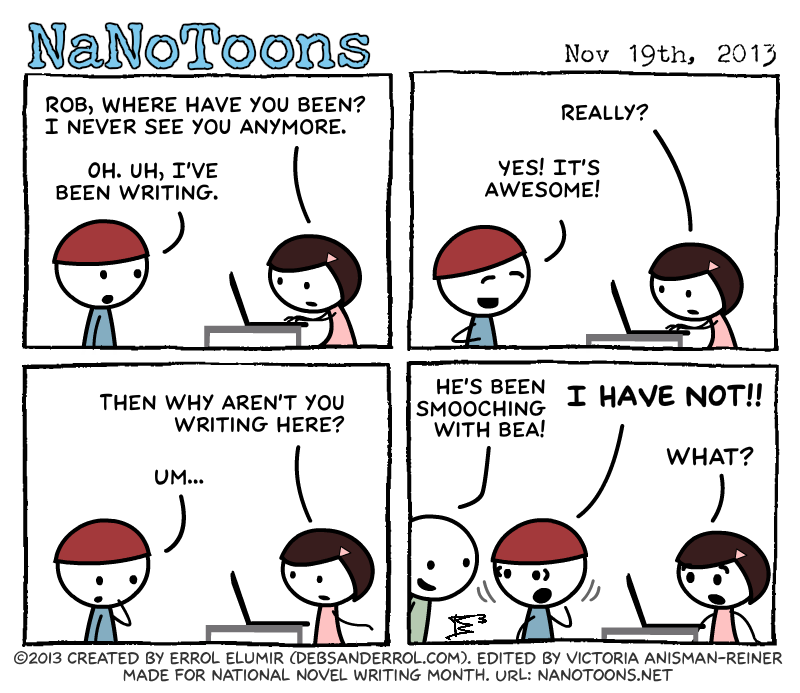 Cue Music: Don’t date during NaNo!!!!! !